orsobYanco: SCOPERTA UNA SALINA SU MARTE TESTIMONIANZA DI UN MARE SALATO EVAPORATO MILIONI DI ANNI FA, POTREBBE OSPITARE LA VITA? 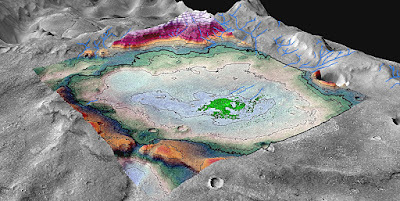 SCOPERTA UNA SALINA SU MARTE TESTIMONIANZA DI UN MARE SALATO EVAPORATO MILIONI DI ANNI FA, POTREBBE OSPITARE LA VITA? inglish version Researchers at the University of Colorado Boulder examined an 18-square-mile chloride salt deposit (roughly the size of the city of Boulder) in the planet's Meridiani region near the Mars Opportunity rover's landing site. As seen on Earth in locations such as Utah's Bonneville Salt Flats, large-scale salt deposits are considered to be evidence of evaporated bodies of water. Digital terrain mapping and mineralogical analysis of the features surrounding the deposit indicate that this one-time lakebed is no older than 3.6 billion years old, well after the time period when Mars is thought to have been warm enough to sustain large amounts of surface water planet-wide. Planetary scientists believe that the solar system formed approximately 4.6 billion years ago. 'This was a long-lived lake, and we were able to put a very good time boundary on its maximum age,' said Brian Hynek, a research associate at the Laboratory for Atmospheric and Space Physics (LASP) at CU-Boulder and lead author of the study. We can be pretty certain that this is one of the last instances of a sizeable lake on Mars.' Based on the extent and thickness of the salt, the researchers estimate that the lake was only about 8 percent as salty as the Earth's oceans and therefore may have been hospitable to microbial life. 'By salinity alone, it certainly seems as though this lake would have been habitable throughout much of its existence,' said Hynek, who is also an associate professor in the Department of Geological Sciences at CU-Boulder and director of the CU Center for Astrobiology. He noted, however, that other factors such as acidity levels were not included in the scope of the study. The study was in the journal Geology. One recent study claims water on Mars was flowing on the planet much more recently than first thought - and experts believe it is likely to appear again relatively soon. Observing gullies on the surface, researchers found that melting snow and ice could cause brief flows to move across the planet. This was due to a favourable tilt of Mars just 500,000 years ago, and a similar tilt will occur again in 140,000 years.